Nissan’s Altima nameplate first came on the scene in 1993. The ensuing twenty years have been witness to multiple advancements within the automotive industry and the new 2013 Altima is a fine testament. Nissan’s mid-size sedan has ample room for four people, five if you have to. Head room is not a problem, nor is entry/exit from either front or rear doors. We know that sounds trite, but you’d be surprised at how many manufacturers miss that most basic feature. Inside a car is where we spend most of our time and Nissan’s designers have focused much energy on those details. The rounded dash, combination of smooth vs textured surfaces, and complete lack of gimmickry rate Altima’s interior among the best we’ve seen. Of special note is their use of both round knobs and push buttons where each is best suited. Think about that for a minute. Considering how some newer cars have become over-teched to the point of us drivers not being able to adjust the fan or radio volume without logging onto the internet for instructions and you get the point. All controls and switches are where they logically should be. No need to consult the book. We found the front seats in particular to be very comfortable over a long ride. Turns out that Nissan teamed with NASA to design the seats with an eye toward reducing spinal loads and improving blood flow. This translates to a terrific set of seats. Under the hood of a 2013 Altima 3.5SL lies a 3.5L DOHC 24-valve V6 cranking out 270HP and 251 lb-ft of torque. Coupled to their new reduced friction CVT transmission and front wheel drive, Altima pulls stronger than you’d expect from a mid-sized sedan. Front and rear stabilizer bars beef up the suspension and team with Nissan’s Active Understeer Control system to provide a solid, predictable feel through the twisty roads while not compromising the freeway ride. Paddle shifters are included for those inclined to shift their own gears. We chose to deactivate the (optional Technology Package) Blind Spot Warning System. The alarm tone kept sounding at seemingly random intervals. It became a game for us to see how many tones we could generate on a clear road as the sensors alerted us to multiple stealth dangers. Some fine tuning is in order before this becomes a useful system. Altima comes in a variety of option packages. You don’t get to choose from many additional features, you simply select the level you want and off you go. Our 3.5 SL is top of the line yet only tips the scale at $30,080. 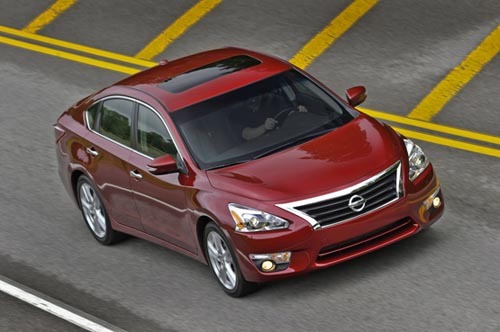 On our standard range of Keeper to Leaver, the 2013 Altima 3.5SL is a Keeper, by all means. Bose Premium Audio System; leather-appointed seats; Power sliding moonroof; Xenon headlamps; etc.